Rare-earth elements (REEs), such as scandium, are in high demand, but it is often difficult to economically recover and extract them. Now, II-VI Inc. (Saxonburg, Pa.; www.ii-vi.com) has developed a patent-pending process utilizing selective ion recovery (SIR) that enables highly selective extraction of scandium and other targeted REEs from streams with concentrations as low as 6 ppm. The process is also more economical than other REE extraction methods, since it eliminates the solvent-extraction and ion-exchange steps, as well as the processing and disposal costs associated with handling large volumes of solvents and reagents, says Shailesh Patkar, senior corporate development manager at II-VI. “Conventional extraction methods also face practical issues with rheology, phase separations and interference from competing ions, which can result in low yields,” adds Patkar, comparing SIR to a chemical “magnet” that separates desired REEs from other metals, even in the presence of undesirable elements, such as iron. 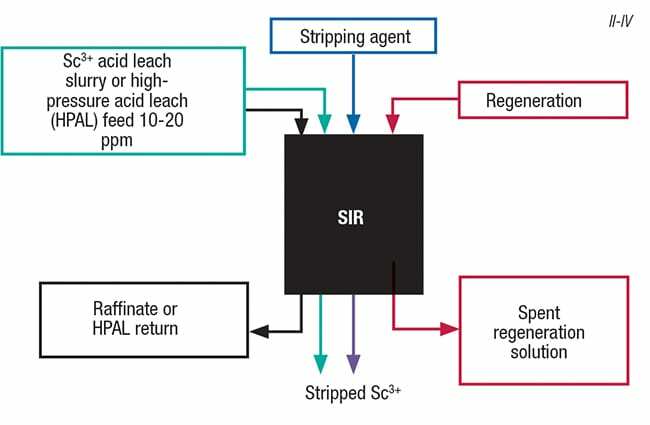 In the SIR method, an acidic slurry containing scandium, typically generated in the production of titanium, aluminum, nickel, tungsten or other metals, is passed through a series of columns containing II-VI’s selective extraction material, which is a chemically modified polymeric resin designed to capture the targeted element. After the resin is saturated with the desired metal, the columns are flushed with a proprietary stripping agent to retrieve the metal. Both the resin and the stripping agent are recyclable and can be used for multiple cycles, reducing the cost of the process, explains Patkar. II-VI has demonstrated the technology at rates of 10 L/h, and plans are underway for a 250-L/h pilot plant, which will be installed in Greece during 2019. 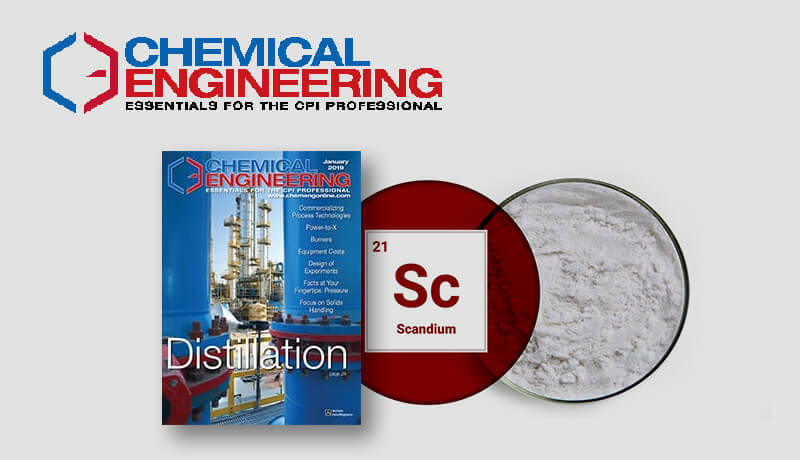 The process is designed for integration into larger chemical-processing facilities, and considers the widely varied feedstream concentrations encountered in commercial operations. “The process is designed to accommodate this variation and cause minimal disruption in the main process,” says Patkar.